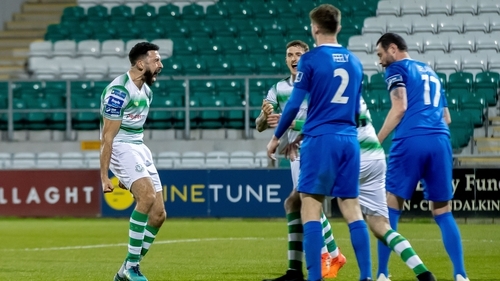 Shamrock Rovers are title winners in waiting after moving an incredible 13 points ahead of Dundalk with this latest bloodless success over a demoralised Waterford, despite an Aaron Drinan consolation for the visitors at the death. Dundalk's shock reverse in Sligo means that Rovers – who admittedly have played two games more than the champions – only have themselves to blame if they do not regain the Premier Division crown for the first time since 2011. Goals from Sean Kavanagh and Roberto Lopes decided this outcome but most striking was that, despite the loss of critical anchorman Greg Bolger in the warm-up, Rovers won without looking like they were anywhere near full tilt. Jack Byrne was essentially unplayable and Waterford, whilst shaping well in the opening quarter, were essentially a beaten docket once they fell behind. They barely fashioned a chance on goal, testament to the quality of a Rovers defence that has conceded just three goals from open play in the league this season. Indeed, so impressive is centre-back Lee Grace, the one worry for Rovers in terms of the title battle would be if a British club snapped him up in the summer, or if keeper Alan Mannus suffered an injury. Byrne is their best player – but they have no shortage of replacements. Waterford cannot be accused of not giving it a go. A smashing break saw Zach Elbouzedi in on goal to an extent but he blasted over early on; one sensed that the Blues needed to be making the most of these half-chances – but they did begin with a confident attitude. At the other end, Sean Kavanagh did the same as Elbouzedi after near play by March's player of the month Byrne. The opening goal illustrated the threat Rovers pose with midfielders breaking. Aaron Greene did well to hold up then ball and release Trevor Clarke. He had a few options to aim for, Kavanagh controlling his delivery well and slotting into the far corner. Superb play by Byrne, his scooped pass finding Greene, saw the latter cross but Clarke make a mess of his shot when he should have scored. Superb play by Aaron McEneff, his brilliant backheel finding Ronan Finn, highlight the form the Derryman is in – even if he had to embrace a deeper role here. Greene, excellent throughout, somehow failed to convert from close range after Finn's cross. Rovers' football was so impressive at times that, early in the second half, a stunning long-range pass from Byrne barely prompted a ripple of applause from a home crowd that has already become accustomed to winning. Byrne was essentially playing with a cigar in his mouth and a frustrated Karolis Chvedukas was lucky not to see a red card for a crude challenge on him on 57 minutes. Byrne accepted the Lithuanian's apology without hesitation. Clarke put in a stunning cross for Finn with an hour gone, but his header was well-saved by Matthew Connor, who did not have much to do despite Rovers' dominance. By this stage, Waterford were growing frustrated, with striker Drinan ever more isolated in attack. And the game was over as a contest midway through the half with Roberto Lopes heading home Byrne's corner. Man of the match Byrne deserved a goal but his 79th-minute curler edged wide in front of the gushing Rovers fans. Just afterwards, the tireless Greene was taken off to a standing ovation. Byrne was given the same as he strolled towards the dugout with four minutes left, Brandon Kavanagh – a player other teams would love to have in their starting 11 – afforded a cameo. A rare Grace mistake afforded Drinan the chance to drill home with effectively the last kick after an Izzy Akinade centre. Early stages in the title race, but special days if you are a Rovers fan. Shamrock Rovers: Mannus; O'Brien, Grace, Lopes, Clarke; Watts (Coustrain 68), McEneff; Kavanagh, Finn, Byrne (Kavanagh 86); Greene (Vojic 80). Waterford: Connor; Feely (Poynton 85), Kouogun, Delaney, Lynch; Hery (Akinade 68), Lunney, Duggan, Chvedukas (Galvin 68), Elbouzedi; Drinan.